Here at Real Stone & Tile, we love anything out of the ordinary when it comes to tiles and we're thrilled to see the 3D-effect trend hotting up. With the metallic trend soaring, the Aria Bronzo tile will certainly add warmth and sophistication to your room of choice. Here it is used on one wall within in a bedroom and the effect is stunning. Make sure to use other in keeping colours, such a browns or blacks, to ensure the room looks seamless. This off-white tile is very suited to bathroom environments. It can be laid in endless combinations and will create a very unique look. 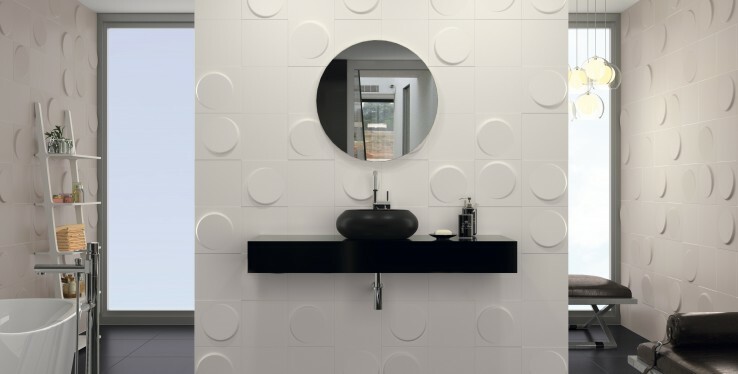 Use it in conjunction with the 'Shapes Panna' - a flat tile that will offset the beautiful circular shapes of the 'Luna Panna'. Create a variety of patterns with the Mandorla Luce tiles, thanks to the bespoke almond shaped form. Available in bronze, white and cream, this product works in almost any room. The beauty of these ranges is that any shape and colourway can work. Here, the Luna tiles, in off-white and bronze, make a very interesting back drop, dividing the room into a lounge and a dining area. This blog gives just a small taste of what Dune has launched for 2017. For more information, please visit our Cheadle showroom or call us on 0161 485 1373 – we're open 7 days a week!